Do you need help in losing weight? Do you know the cause of your weight gain? Gavin uses a professional naturopathic system that is designed to get you burning fat but also making it easy to achieve results. Click straight to the program here if you can't wait. The initial consultation aims to isolate the cause of your weight gain. Whether it is because you have a thyroid problem, diabetes, liver toxicity, protein deficiency, are not exercising efficiently or simply enjoy to much of the 'good things' in life. 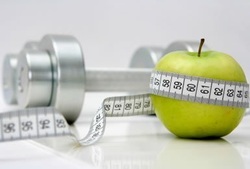 Once your cause is identified then it is easier to implement the weight loss program. And it will be more effective and achievable. Regular testing is used during the program to help keep you on track and reward certificates and coupons are given once you reach a milestone. Gavin also works in conjunction with exercise specialists to provide you with the most appropriate selection for your workout. Have you been on every weight loss program only to go back to where you started? Once you have reached your ideal weight, then Gavin can show you a 'wellness' diet which is designed to keep your weight and overall health in optimal condition. No more yo yoing, and no more feeling really great for a while only to go backwards. To find out more about the weight loss system then click here.